Specific Kidney Support FKW Wet Food Trays for Adult Cats is a balanced diet designed to provide nutritional support for cats with kidney, heart and/or liver insufficiency. Containing a reduced amount of protein, high levels of Omega-3 fatty acids and a careful balance of essential vitamins and minerals, the diet will help to reduce the workload on your cat’s kidneys and support a normal blood pressure. A low sodium level also helps avoid water retention, which is vital for kidney, liver and heart patients. This is good value as specialist foods go, and recommended by the PDSA. It took a few sessions for my cat to take to it but he will eat it, which is a good job as he is as stubborn as they come. I wish VetUK would lower their postage charges so that this wasn't expensive overall. This is the 3rd brand of wet cat food I have tried for my boy Flixy. This is the 1st he's started eating straight away. Delighted. The food has a very soft texture, like pate. Hills science K/D pouches he just lapped up the gravy and the tinned food, most went in the bin as he rarely touched it. So fingers crossed I"ve found cat food that he will eat! My 21 year old lady has thyroid problems and now has early stage kidney problems. I give her Royal Canin renal food anad thought I would try this for a change. Glad to say she loved it so will order more. The only renal diet my fussy burmese will eat. Very glad to have found this. Our 12 year old female cat has been on kidney diet food for over a year now and her health is good as a result. This is her favourite of the four varieties we rotate (she gets bored otherwise!). My cat loves this food and has gained weight and her coat looks so much better since starting on it. I give her a combination of this and the Eukanuba dried kidney support food as she likes dry food too. The vet had warned me that cats often don't like kidney support food, but this is a hit! Especially as it has a paste consistency, she doesn't like the food that has chunks in it. Highly recommended!! 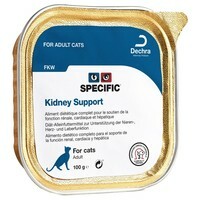 My cat will only eat this and purina renal foods, this is his favourite. He doesnt like eukaneuba, hills, or royal canin. My 19 year old cat loves this food. She licks her dish clean when I give it to her. She does eat other renal foods but this one seems to be her favourite. My cat likes this as well, she is 17, it's like a paste. She normally has pouches, so this gives her a change every now and then. My 17 year old cat was diagnosed with chronic kidney disease two years ago. I have tried different brands of renal food and until now, Royal Canin was the only one she would eat. She does seem to get bored sometimes so I ordered the Specific Kidney Support trays to try to give her some variety and it's been a success. She is doing very well on a mixture of Royal Canin pouches and dry food plus Specific trays and has even put on some weight!